After several weeks of playoff roller derby, the 12 best Division 1 teams in the WFTDA have risen to the top of the heap, ready to face off against one another in St. Paul, Minn. at the 2015 WFTDA Championships on November 6. This past weekend, the final Division 1 playoff in Omaha saw Gotham, Angel City, and Minnesota finish in the top 3 and qualify for the finals. Immediately following the last playoff game, the WFTDA held the random draw that seeded the teams into the final bracket. Gotham joins London, Victoria, and Rose City in automatically advancing to the second round with byes. The other eight teams—Angel City and Rat City; Bay Area and Denver; Jacksonville and Arch Rival; Texas and Minnesota—will play each other in the first round. The top seeds will face the winners of those games the next day, and later that evening the four remaining teams will play in the semifinals. Then on Sunday, November 8, the third and first place games for both Division 1 and Division 2 will be broadcast live in the United States on ESPN31, where we’ll determine the 2015 WFTDA Champions. For the playoff prognosticators among us, the time between then and now presents an opportunity to think about how the games may go. Are teams getting a bad beat or lucky break with their draws? Which games might wind up being the closest? Does anyone stand a chance of taking it to Gotham this year? To get a rough idea at the competition we might see in Minnesota next month, we looked at the brackets and tried to determine what the most likely outcome would be in each game, based on previous results in 2015 and probable future results using Flat Track Stats and their handy-dandy bout predictor tool. Six of the matchups that will or will likely happen at WFTDA Championships will be between teams that have already played against each other in the regular season. As a general guide to forecasting how the brackets will play out, we will assume that a team that’s previously beat a team will be likely to beat them again, especially if it was done by a large margin the first time. For the teams that have not played against each other in 2015, we can get a rough idea of what kind of game they can expect to produce via Flat Track Stats. We’ve plugged in the teams likely to see each other, and FTS spit out its probability projections for the winning team and the expected score ratio. Flat Track Stats doesn’t go as far as guessing actual game scores, but we’ll try it. Using a combination of the predicted FTS score ratio and an adjusted average of total points scored in the closest playoff game for each team2, we’ve produced a score projection for their potential/actual games at Champs. These projections, seen in red in the chart below, aren’t crystal-ball guesses at what the score final will be if/when teams actually play each other. Instead, they are merely an understandable interpretation of the calculated FTS ranking difference between the two teams, based on how their playoff games have gone to this point. After inserting our score projections into the Division 1 Championships bracket alongside the actual scores of games played earlier this year, we’re left with a starting point for you to base your own predictions off of. Click for full size. Each game includes an explanation of the FTS projection data (red scores) or when and where the two teams played each other earlier in the season (blue scores). Okay, maybe that’s not so bold of a prediction, especially with how good Gotham is looking this year. Based on these projections, anyone that faces Gotham will have a very difficult time overcoming them. 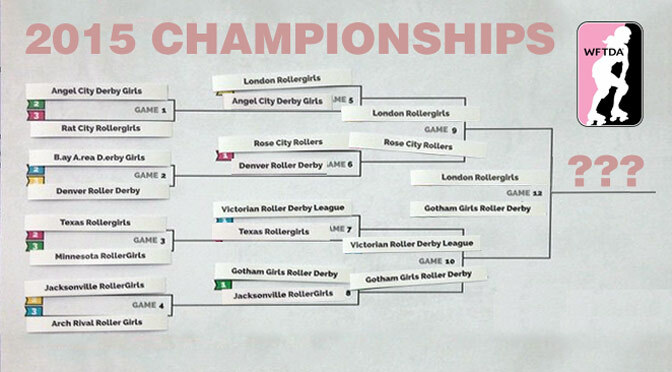 London, despite being the second-best team in the WFTDA according to Flat Track Stats, is a heavy underdog to Gotham should the two meet in the Hydra final. We’ll talk more about Gotham later. First, let’s back up and see what the games early in the bracket are looking like. Two of the first four games are rematches. In August, Jacksonville beat Arch Rival 193-112, though it was in Jacksonville. Minnesota will be much closer to home for Arch Rival, which could help them out there. However, that margin of victory seems pretty comfortable for Jacksonville to be the smart choice for move on. Bay Area and Denver will also be seeing each other again, but things will be a lot less predictable this time around. A 24-point win by Denver leaves a relatively small margin for error, especially coming into another neutral venue for Champs. Still, Denver beat Bay Area before, meaning for the purposes of this forecast, they are capable of beating Bay Area again. One thing is for sure: It will be a very good game! The two other games will have teams battling each other for the first-and-last time in 2015. Angel City is a favorite over Rat City. Their game should be much closer than the last time the two teams met in June 2014, when Angel won 250-79. There’s potential here for a good game, but Rat City has a lot to make up if it wants to pull off the upset. What of the tournament hosts, Minnesota? Playing at home in front of their own fans is going to give them a huge edge.3 However, they come into Champs as the weakest team, per FTS rankings. Not helping matters? They’ll face Texas, the strongest team that didn’t earn a bye. Playing at home may not be enough help in what is looking like the most lopsided matchup in the first round. Three out of the four here are also rematches from earlier in 2015. London dispatched Angel City quite easily in June, winning in Los Angeles 218-117. Rose City beat Denver at home in Portland that same month, 250-161. (If Bay Area beats Denver in the first round, a Rose/Bay Area game would also be a rematch, but a far less competitive one. Rose won by 177 points in their first game against Bay Area.) With 100 points of cushion to work with, London and Rose City look like shoo-ins to win again and meet in the semifinals. Victoria’s defensive wizardry was on display at The Big O when it KO’d Texas 165-90. The outcome of their do-over is a little less certain, however. It doesn’t take much for low scoring game to turn into a high scoring game in the WFTDA, and Texas was involved in a lot of high scoring games during their playoff run. (Rose City beat Texas 257-223 in Dallas, for example.) If Texas can make Victoria play in a shootout, the score difference in their first game may not hold up. Easier said then done, of course. This leaves the probable Gotham/Jacksonville game as the last of the quarterfinals. Even with the top 12 teams in the world facing each other, there will be blowouts at Championships. This game is liable to be the worst blowout, with FTS expecting Gotham to score three times as many points as Jacksonville. That’s too much for New Jax, even if they play out of their minds. Even this deep into the brackets, we’ve seen one of these games before. London previously beat Rose City 193-129 while Rose was on a tour of Europe. Teams on the other side of the Atlantic have a huge advantage playing American opponents on their home soil due to the time difference. With how many times London has made the trip to the States, however, that advantage is probably not reciprocal for Rose City. London should still be considered a favorite here, but in what will almost certainly be a competitive game. Victoria will take their shot at Gotham in the other probable semifinal. A win for Gotham is the most likely outcome here, too. A team as highly-ranked as Victoria should at least manage to get as close to Gotham as any other team they’ve faced thus far—if you consider a projected 100-point blowout to be “close.” Victoria’s defense should hold Gotham to under 200 points, at least. How close the game ultimately winds up being will come down to how well Victoria’s jammers can handle Gotham’s blockers, who haven’t given up 100 points all year. The closest game of Champs, should it happen—and we’re pretty sure it’s going to happen—would be Victoria vs. Rose City for the bronze medal. Our score projection for this game is almost meaningless, because no paper calculation can comprehend what may happen when an unstoppable force meets an unmovable object. Specifically, when Rose City’s jammers run into Victoria’s blockers. To forecast that this has Game of the Tournament potential isn’t so much as trying to predict the future, as it is stating the bleeding obvious. Here’s another statement that’s obvious: Gotham has the inside track to win yet another Hydra trophy as champions of the WFTDA. That didn’t seem so clear last year, especially with one jam to go in the final. Before the Rose City/Gotham game, Flat Track Stats gave Gotham a 75% chance of winning and an expected score ratio that was ultimately 45 points less than what the actual score was, 147-144. 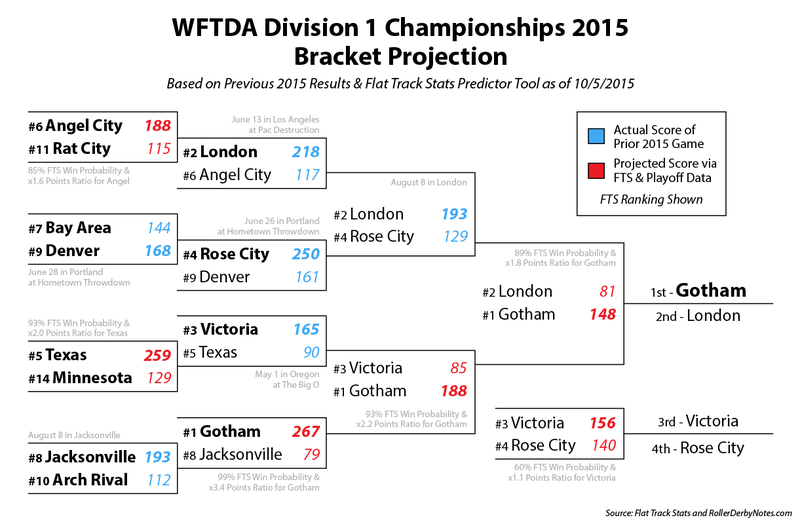 This year, the best hope in the WFTDA is London, who is about as strong as Rose City was last year. However, it is very clear that Gotham is stronger in 2015 than they were in 2014. Their 1000+ Flat Track Stats rating, which is the first time a WFTDA team has sustained that high a score, has bumped up Gotham’s win probability to nearly 90% in the hopeful Hydra final. In plain terms, that means Gotham has more breathing room to make mistakes against London, since their scoring power can correct any mistakes they make. To drive this point home, last year Gotham was thoroughly outscored by Rose City 113-69 in the 36 jams with 1- and 2-pass scoring. Basically, Rose City was laying a whuppin’ on Gotham for 85% of the game. Unfortunately for Rose, in the six jams—a measly 15% of initial pass opportunities—where a team scored in three or more passes due to long jams, penalties, and/or power jams, Gotham did juuuuuuuust enough to recover from their game-long poor play and outscore Rose 78-31.4 Four of those Gotham points turned out to be the winning ones during the last jam. If London, or whoever faces Gotham in November, wants to have a legitimate chance of beating them, it’s going to have to overcome the fact that Gotham can very quickly, and often very easily, score points at will during penalty-heavy sequences. No matter how well a team plays in even strength, if it can’t slow down the likes of Bonnie Thunders, Shortstop, Vicious van GoGo, during those few lopsided jams, they won’t win. When projecting whether or not Gotham can take an unprecedented sixth WFTDA Championship and fifth in a row, you always have to go back to the question: What’s most likely to happen? When it comes to Gotham, the answer to that question should be pretty clear, even without running the numbers. Or on WFTDA.tv outside of the U.S.A., just like normal. Average of 332 and 275 = 304 points, the number of points we are ballpark-projecting Rat City and Angel City will be competing for when they play. The average is proportionally reduced (the “adjusted” in adjusted average) for the 1st and 3rd place games, assuming that fewer points overall will be scored there. An edge we’ve included in this projection. The Flat Track Stats predictor tool produces different probabilities depending on who the home team is. For everyone else, we’ve averaged the home and away projections for a “neutral” calculation. For Minnesota, we used the home projection only. That works out to 18.17 points per jam (PPJ) in these six jams, against 5.05 PPJ in the other 36 jams. Which of these yielded more competitive roller derby? On a personal note, I still felt a Gotham victory was inevitable during the closing stages of the Gotham/Rose City game last year. It was statistically likely that Gotham (any WFTDA team, really) would score a ton of points very quickly in that situation. Verily, it came to pass.